Growing onions in your garden can be a great way to add wonderful flavor to all types of homemade soups, sauces and dishes. Even better, onions are one of the easiest crops to plant and maintain! They require little space, little long-term maintenance, and are simple to harvest and store. Let’s take a look at how to plant your own successful crop this year! Like most vegetables, onions grow best in rich, fertile and loose soil. Onions planted in a loamy soil mix have a much easier time of growing to their full size. If your soil leans to the heavier, clayish-side, add a shovelful of sand to help. Along with the compost, sand will aid in loosening up the soil structure. 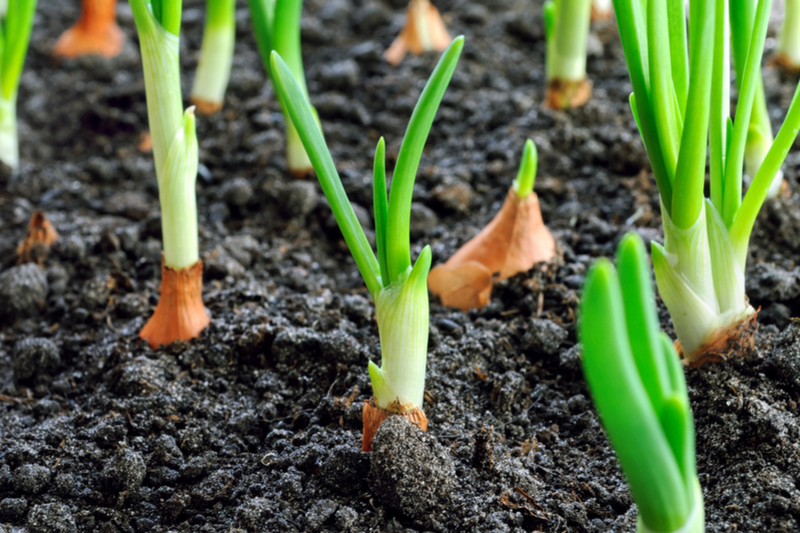 When it comes to growing onions at home, you can plant either seed or onion sets (bulbs). Onion sets will take off a bit quicker and tend to harvest larger that seed crops. Seed is a bit less expensive, but also harder to maintain with thinning and weeding. When growing onions with sets, start by digging a trench 2 to 3 inches deep. Fill the trench 3/4 full of compost, and then plant bulbs down into the compost layer. Space bulbs about 4 inches apart. When planting, be sure to keep the pointy end of the onions up. Cover the trench with the remaining soil, and finish off with a light layer of shredded leaves or straw on top as a mulch. Onion seeds can be planted in rows as well, but need to be planted much shallow and near the surface. Fill the trench / row with a mixture of compost and soil, then plant seeds about 1/4 into the surface of the soil. Place a seed every inch or so to insure good germination. To cure and store, brush off all loose dirt and lay out until the tops brown off and curl. Once the onions have grown through the surface, thin plants to every 3 or 4 inches. Mulch with a few inches of straw or shredded leaves once you have thinned. Onions need consistent watering to reach their full potential. Water both sets and seeds every three to four days during their first few weeks. After that, weekly watering is a good idea if you are experiencing little to no rain. Onions can be harvested at any time, it really depends on how you will be using them. Tender 2 to 4 week onions can be pulled from the soil as scallions or spring onions. Left to grow in the soil longer, they will continue to grow to a fuller, more mature size. If you like a steady supply of spring onions, plant every few weeks as the season progresses. Mature bulbs are ready for harvest when the top of the green shoots begin to turn yellow and fall over. Pull up from the soil and shake off any loose dirt. Be careful not damage the skins at this point to avoid the onions prematurely rotting. Lay the onions out for a few days in a warm, protected area with the tops attached so they can cure. Once the tops shrivel up, cut the stalk off and store in a cool, dark place for long-term storage. Share Your Gardening Advice With The World! Have a gardening tip? Maybe you would like to share a few pictures and a story about your own personal garden paradise? Then email us today at info@thisismygarden.com. You can also use the “Feature My Garden Tip”button at the top of the website for your entry. Help make This Is My Garden the best garden site around and share your garden knowledge with fellow gardeners! This article may contain affiliate links. Growing Sunflowers – Gorgeous Varieties For Any Landscape! How To Grow Hops – A Beautiful Climbing Perennial For Any Landscape! March 14, 2018 ThisIsMyGarden Comments Off on How To Grow Hops – A Beautiful Climbing Perennial For Any Landscape! What are companion plants for onions in raised beds?